Dawn Harp and Lars Androsoff were fully confident flooding didn't threaten their home near southern British Columbia's Kettle River. Then the couple awoke at 1:30 a.m. on May 11 to the sound of floodwaters flowing beneath their Grand Forks home's floorboards. “I never thought this would happen in a million years,” said Androsoff, 42. But climate change researchers say this month's B.C. floods, and the record-setting New Brunswick floods before them, are a glimpse into the future for people who live near Canada's many rivers. Residents who thought their homes were safe must either move to higher ground or take flood-proofing steps, while governments have to accelerate the creation of flood risk maps and zoning rules, they say. “The most recent flooding in New Brunswick and south-central British Columbia are reminders we can no longer 'cheat the system' on flood risk,” Blair Feltmate, who leads a federally appointed panel studying climate adaptation, said in an email. 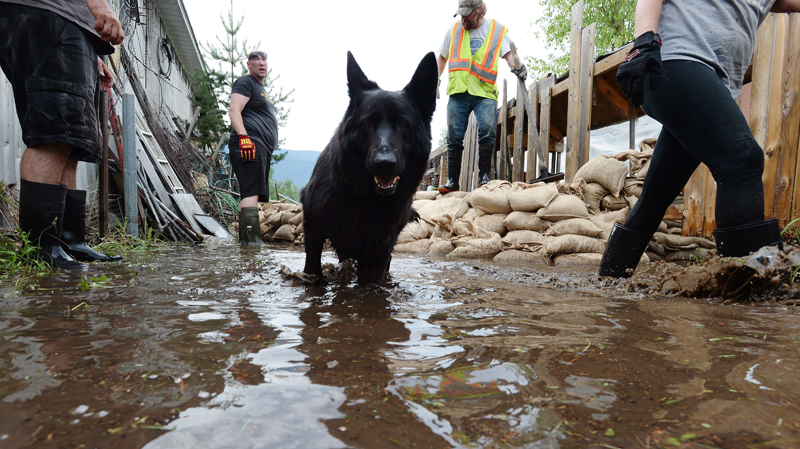 Harp, who is being treated for lung cancer, and Androsoff, a certified meat cutter at a local facility, had hoped a nearby dike would protect them when they bought their house seven years ago, but it was overcome by the rushing waters that had surged through southern B.C. 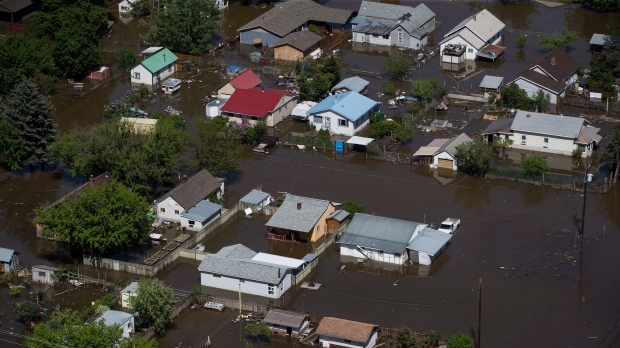 Like most residents of the neighbourhood of North Ruckle, or the flooded areas of New Brunswick, they have no insurance for the loss of most of their possessions. Feltmate says as the waters recede in B.C. and New Brunswick, it's important public attention stays focused on better preparation for the next round of rising waters - so fewer citizens like Androsoff and Harp are caught off guard. “Every day we don't adapt is a day we don't have,” says Feltmate, an environmental scientist and head of the Intact centre of climate change at the University of Waterloo, which completed a 2016 study that showed just six per cent of 2,300 Canadians living in high risk flood zones were aware of the potential devastation they faced. Feltmate is among the advocates arguing there's an urgent need for easily accessible, high-resolution flood risk maps that precisely point out potential damage to properties; zoning rules that strictly restrict developments in vulnerable areas; and help for residents to move or prepare. Governments must move more swiftly on these and numerous other preventative measures, such as ensuring home inspectors are trained to recognize flood risk and warn homebuyers, he says. For those caught in rising waters, the price is financially and emotionally devastating. Insurance Bureau of Canada figures bear the personal experiences out to the wider scale. From 1983 to 2008, annual flooding insurance claims ranged from $200 to $500 million annually, but have consistently been over $1 billion annually since 2009. Feltmate says basic basement floods - either from rivers or isolated downpours such as occurred in Burlington, Ont., in August 2014 - have become the single largest cost of climate change-related damage in Canada. His research institute has estimated the average basement cleanup costs $43,000. These are the kind of expenses uninsured New Brunswick residents are also grappling with after the rise of the Saint John River to historic levels, touching as many as 12,000 homes and cottages and resulting in an early estimate of $80 million in damage. Meanwhile, in B.C., thousands of residents are returning to homes this week marked with red or yellow signs indicating a health inspection is necessary before they're reoccupied. Sean Allen, a mechanic who lives in Maugerville, N.B. - a community downstream of Fredericton on the eastern shore of the Saint John River - already has estimates of over $100,000 for the river water damage to his home, which he'd believed was safe when he first moved in. When he purchased his home 22 years ago, he said, he was told the river hadn't been that high in the past. “It's a kilometre from the shore,” he said. Now he's considering moving if he can receive enough disaster relief from the province to pay out his mortgage. Feltmate says provincial flood maps that have the latest climate change models factored in could help people avoid similar fates, provided governments move to encourage citizens to regard flood protection as a necessity of any home purchase. Ottawa is working on standards for the updated maps, and is providing funding to provinces and territories in part through a $2-billion national disaster mitigation program introduced in the last federal budget, she said. Spokespersons for the B.C. and New Brunswick governments said work is underway to improve the resolution of maps, with New Brunswick saying the higher “modernized and updated” maps are expected by 2020. However, the wider issue is whether provinces will prevent development in areas already known to be at risk, and whether it will become mandatory for real estate disclosure statements to reveal flooding danger, says Feltmate. Brian Burrell, who worked as a hydrotechnical engineer in the New Brunswick government during a flood mapping program from 1981 to 1994, says a rough outline of the high water marks of past floods were made available in his province, but they didn't prompt regulatory reforms once published. He said successive governments failed to end development or to create financial disincentives for building on the flood-prone areas, though some cities did bring in some zoning restrictions. In his travels across Canada, Feltmate says he consistently encounters resistance from homeowners and developers who aren't eager to have fresh restrictions that devalue their properties, and politicians who are worried about the political fallout. The political scientist argues in a recent study that in addition to accurate, precise risk maps, there's a need in Canada for “clarity on who should be responsible for disclosing flood risk and when.” For example, in California, property sellers are required to tell potential buyers if the property is located in the 100-year flood zones. If money is spent on mitigation and prevention, Canadians and governments will save billions of dollars in years to come, said Feltmate. “What we have found is that for every dollar spent by a homeowner to mitigate flood risk, they will on average save $8 to $12 over a decade from basement flooding that doesn't occur if they act on these recommendations,” he said. But for thousands of Canadian homeowners like Androsoff and Harp, there's uncertainty whether they'll get another chance to prepare, as they piece together their lives again. They plan to apply for disaster relief from the province, and await word on whether their home can be repaired and kept safe. “We have a travel trailer, a home on wheels. Other than that, it's one day at a time,” Harp said.